There are certain medications that everyone associates with abuse and addiction — Xanax and Oxycodone are just two examples. But Fentanyl is not a name society at large connects to misuse; in fact, many have never even heard of the drug. Despite this, Fentanyl addiction is becoming widespread, even contributing to the high-profile overdose deaths of Tom Petty and Prince. Part of what makes Fentanyl addictive is its strength; the drug is estimated to be about 80 times as potent as morphine and hundreds of times more potent than heroin. Although it can be used for medical reasons, such as pain management, it is still essential to be able to identify signs of Fentanyl abuse. Fentanyl abuse can arise from being prescribed the drug, taking illegal drugs cut with Fentanyl, or purchasing Fentanyl without a prescription. Its use has been linked to the continued rise in Fentanyl overdose deaths throughout the United States. Due to its high level of toxicity, any use of this drug has the potential to be deadly, making it vital that the signs of abuse be spotted as soon as possible. So, what are some typical Fentanyl addiction symptoms to look for? There are also behavioral symptoms to watch for. It is important to note that the signs of Fentanyl addiction are mostly the same as signs of pain pill use in general, so these symptoms alone cannot be used to diagnose addiction to Fentanyl. As is the case with all opioids, Fentanyl works by attaching to the opioid receptors in the brain. Given that the medication targets explicitly the brain, you can expect that addiction will result in psychological changes. The primary psychological signs of Fentanyl addiction are the euphoria experienced directly after the drug is taken and the depression and confusion that follows; these are signs that will be present in all persons using the drug due to its high potency. Fentanyl is a short-acting drug; its effects begin within minutes and only last a few hours. This contributes to the extreme high and then sudden drop as the drug wears off. While other psychological Fentanyl addiction signs are not as common, they aren’t exactly rare either. Anxiety is often observed, as well as paranoia. If the user experienced either of these in the past, the degree of their symptoms of Fentanyl use might be elevated. Less common are hallucinations, both auditory and visual; this tends to only present after long-term use. The physical signs that someone is addicted to Fentanyl are mostly the same as the signs of general pain pill abuse. Physical signs of painkillers addiction can also mimic the signs of prescribed use of the medication. The best way to determine if the symptoms are from addiction or standard use is how frequently the symptoms are present and if they are becoming worse over time. With Fentanyl, the medication is not meant for long-term use, so persistent symptoms indicate a problem. Some physical symptoms are only observable by the user or are at least easy to keep hidden. This includes decreased heart rate, stiff muscles, nausea, gastrointestinal issues, and sleep difficulties. More noticeable symptoms are shallow or slow breathing—this can be heard as well as seen in the movements of the chest—general physical weakness, trouble walking, fainting, shaking, and slurred speech. Loved ones may also notice the user struggling to stay awake or being awake but unalert frequently. Pinpoint pupils and loss of appetite are also direct physical symptoms of use. Depending on how the user is administering the medication, there may be skin irritation present, resulting in scratching. As with any addiction, the symptoms are likely to become more pronounced over time. Additional signs someone is addicted to pain pills may also develop, including swollen limbs, frequently becoming ill due to an inhibited immune system, and seizures. While some of these symptoms may seem mild, many are deadly on their own, and even milder symptoms can lead to complications resulting in a lower quality of life, or even death. While psychological and physical symptoms can indicate Fentanyl abuse when it comes to diagnosing opioid abuse disorder, behavioral deviations are given the most consideration; they are also the easiest to recognize. Of course, these are signs of addiction to pain medication in general. Unless you are sure the medication being used is Fentanyl, all you can know from these behaviors is that the individual is abusing opioids. 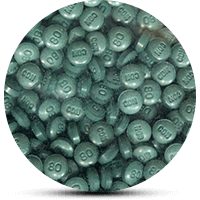 Due to its high level of toxicity, Fentanyl addiction is extremely dangerous. This means it is essential to know the signs of Fentanyl abuse and how they manifest psychologically, physically, and behaviorally. With appropriate action, fatal consequences can be avoided. If you or a loved one are displaying signs of Fentanyl addiction and want help with recovery, contact our addictions specialists by calling our 24-hour hotline at (888)-459-5511.